To find this earthcache, you will be exploring a small area of the valley cut in the vicinity of the road way. The Manitoba Escarpment is a major geographical feature within Central Manitoba. It is also commonly referred to as the Pembina Hills. The escarpment is a ridge rising approximately 500 feet above the Red River Valley running in a north west direction from North Dakota to Saskatchewan. It is such an imposing sight that a portion of it was named a mountain, Mount Nebo. Manitoba's Escarpment has it roots in the Western Interior Seaway over 80 million years ago. The Western Interior Seaway covered much of North America, dividing it into east and west land masses. Global temperature change caused the water to retreat leaving a rich black clay. Over the millions of years since, the layers of clay have been compressed and turned into shale rock. Embedded within the layers of shale are fossils of the abundant marine life once present in the seaway. The Canadian Fossil Discovery Centre in Morden, Manitoba houses the largest collection of marine vertebrates in Canada, all extracted from nearby locations. Along with the shale can be found layers of the mineral bentonite, 13 layers to be exact. Bentonite was formed as ash from volcanic eruptions settled on the sea floor and was later compacted over millions of years. Pembina Mountain Clays mined bentonite for 50 years around the Manitoba Escarpment. The bentonite from the region was in demand due to it's high calcium content. Tens of thousands of years ago, glaciers covered the continent during an ice age. The movement of these glaciers resculpted the landscape exposing the layers of shale and bentonite present within the Manitoba Escarpment. The escarpment however, remained largely unchanged with its shale formation being very resistant to erosion. The escarpment forms the western shore of Lake Agassiz which was filled with melt water runoffs from the glaciers approximately 15,000 years ago. Lake Agassiz covered much of Manitoba, Ontario, Saskatchewan, North Dakota and Minnesota. If it existed today, it would be the largest lake in the world. Lake Agassiz drained and filled as glaciers moved and opened or plugged various outlets. Lake Winnipeg, Lake Winnipegosis, Lake Manitoba, and Lake of the Woods were left behind after the final draining of Lake Agassiz. As well, many modern river valleys, such as the Red and Assiniboine rivers, were originally cut by water flowing to or from Lake Agassiz. The co-ordinates lead you to a valley cut just behind the escarpment at the site of a historic industrial kiln. Note: Please be careful walking and parking on the roadway. 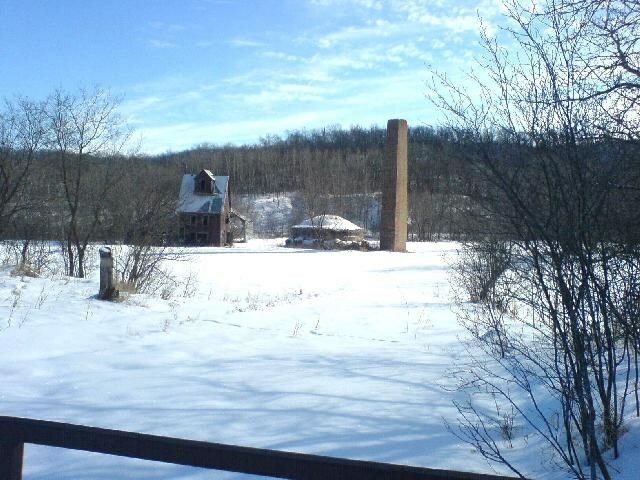 As well, the kiln area is private property and there is no need to venture onto it. 1. Using the Similar Triangle method, estimate the height of the escarpment above the valley floor. Do this by finding the position where the top of the kiln's chimney aligns with the top of the escarpment at the clearly visible hydro towers. The chimney is located at N49 28.651 W98 25.586. 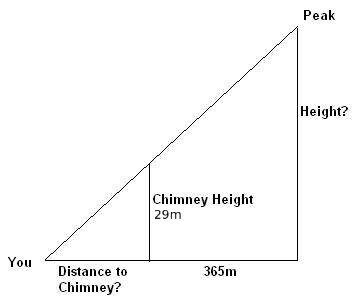 Mark your position and measure the distance to the chimney using the co-ordinates. Your position should be north east of the starting co-ordinates. The distance from the chimney to the top of the escarpment is 365m. The height of the chimney is 29m. Please submit the estimated height as well as your recorded co-ordinates. 2. Of the common elements found in the escarpment, namely shale, clay and bentonite, which were used in the kiln? 3. What product do you think was made in the industrial kiln? You can see examples of it nearby. Vs lbh'er univat gebhoyr jvgu gur gevnatyrf. Znxr gur engvb bs gur urvtug gb qvfgnapr bs obgu gb or gur fnzr.